Every person requires the knowledge of managing personal finance in an effective manner so as to create long-term wealth and assets. 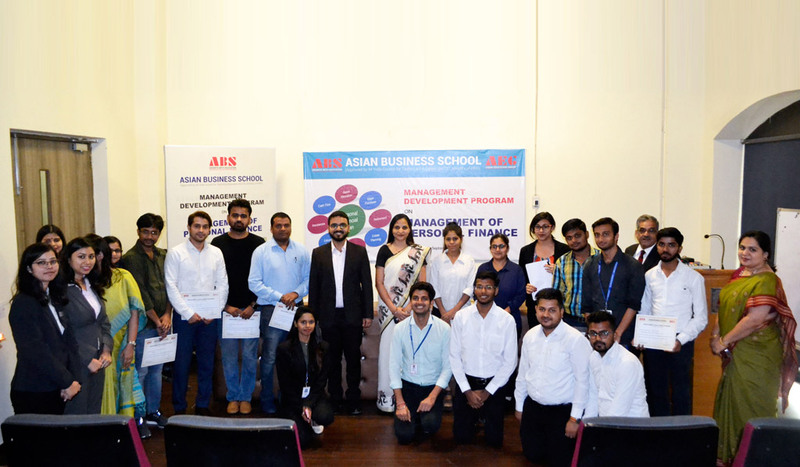 To help individuals develop a professional approach to managing their personal finances, the Research and Development Cell at Asian Business School organized a Management Development Programme on “Management of Personal Finance” on 29th September, 2018. The main aim of the MDP was to enable individuals to understand how financial planning can be used for personal financial decision making and to achieve the long-term financial goals. Prof. Anubhuti Dwivedi, Associate Dean and Prof. Vipul Mehta, at Asian Business School, were the resource persons for the MDP. The MDP started with a welcome note and the lighting of lamp ceremony. The first session was conducted by Prof. Anubhuti Dwivedi with a focus on the topic like-features of various investment instruments like FD, PF, Small Savings Certificates, NPS, Mutual Funds, etc. The key areas of this session focused on understanding the instruments of wealth generation through the management of personal finance. The next session was taken by Prof. Vipul Metha who focused on topic like computation of pre-tax return of the above discussed market instruments for wealth generation purposes, returns on equity market driven instruments vs. returns on debt instruments; computation of post-tax returns of the above market instruments for wealth generation purposes and comparing various investment schemes on post-tax basis – viability for the individual investor. The aim of his session was to make participants understand how to compare risk, return and liquidity, computation of pre and post-tax return so as to make comparative choices while investing money in different schemes. This MDP provided a means of empowering the participants in taking the right financial decisions at the right point of time. The programme was concluded by the valedictory ceremony in which certificates were distributed by the resource person Prof. Anubhuti Dwivedi and Prof. Vipul Mehta. Towards the end of the day, Ms. Veenu Arora presented the vote of thanks wherein she thanked the participants, student coordinators and the supporting staff for their contribution towards making this event successful. There were in all 28 external participants and 30 internal participants for the MDP.